Worship on the Water (WOW) starts this weekend! 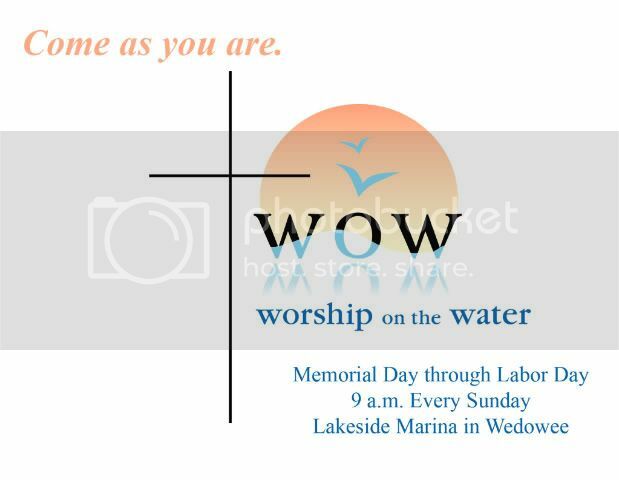 Sponsored by SIFAT, WOW is a casual, nondenominational worship service held at Lakeside Marina in Wedowee, Ala., Sundays at 9 a.m. from Memorial Day Weekend through Labor Day Weekend. Each week features a different speaker and musician. Whether you are a local resident or a weekend visitor, we hope to see you at WOW this summer! It’s almost time for Worship on the Water (WOW) 2014! Sponsored by SIFAT, WOW is a casual, nondenominational worship service held at Lakeside Marina in Wedowee, Ala., Sundays at 9 a.m. from Memorial Day Weekend through Labor Day Weekend. Each week features a different speaker and musician. Whether you are a local resident or a weekend visitor, we hope to see you at WOW this summer! It’s almost Memorial Day weekend, which means Worship on the Water (WOW) is about to begin!